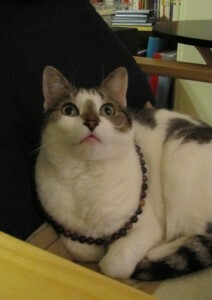 As my blog is about cats and jewellery I thought this time why not combine the two? 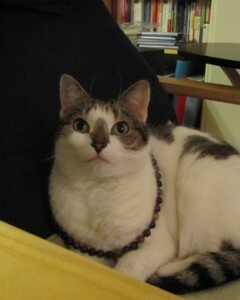 Last weekend I discovered that our cat Bobby is the perfect model for my jewellery. On Saturday I had a photographer around from the Echo, who took photos of me (and I pointed out that Bobby would be a better model than me) for an article about migraines and the Migraine Action Cardiff Support Group I founded on Facebook. I don’t like having my own photos taken, as I don’t think I am photogenic, but as it was for a good cause I said yes. So obviously I also decided to wear at least one piece of my jewellery, which happened to be this gorgeous Tourmaline necklace. 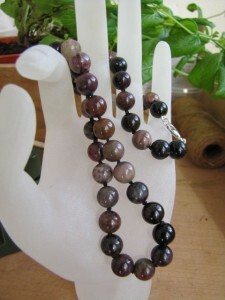 I won the beads, which are 8mm, in a competition from Beads Direct and decided for a change to make something for myself. I love the colours. The only thing is, because I have neck problems I can’t wear heavy necklaces, only pendants, and this necklace is too heavy for me. The photographer is a cat fan and told me about his toms called Sootie and Sweep. He also asked me to show some jewellery from my online shop and took photos of me posing with it, which was really awkward. The article will be published this Wednesday and if I find the link I will post it here. He left and told me that his next appointment was the rugby game and meeting Mickey Rourke – I was so jealous. Mickey is working on a film about openly gay Welsh rugby player Gareth Thomas and is here for his research and I assume filming will also take place in Wales. And being a perfectionist Mickey is not only having Welsh lessons but is also being reported to having his front teeth removed to be as authentic as possible. Mickey is certainly no stranger to plastic surgery, though I have to say removing front teeth is quite extreme. Though I am not into rugby ( I prefer ice skating) I will definitely watch the movie. Loved him in “The Wrestler”, though it was quite a depressing film. In the evening Bobby was sitting in her favourite chair (Ikea Poang – and the best chair in the living room – we have another one in the guest room/office which we bought originally for hypnotherapy clients, because these are very comfortable chairs. 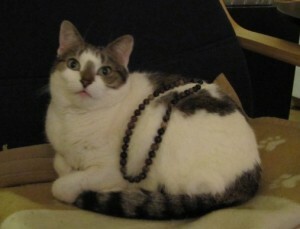 And while she was sitting there I decided to just put the necklace on her and take photos. She didn’t mind and was very patient. And my husband helped too, by distracting her – that’s why she looks up on some of the photos. My cat would never leave them there like that! He’d think they were a toy 🙂 Re Mickey- I think having teeth removed is a step too far! !